Trump, Iran: New Path to War? Parsi is president of the National Iranian American Council and author of Losing an Enemy: Obama, Iran and the Triumph of Diplomacy. He said: “It should now be clear that Donald Trump’s moves to violate and hold certification of the Iran nuclear deal in doubt are actively destabilizing the accord. 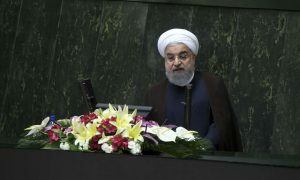 Unfortunately, in response to Trump’s increasingly hostile rhetoric, as well as Congress’ moves to escalate sanctions, Iran is now warning that it has its own options to back out of the deal if the U.S. continues to undermine it. We reiterate our call for all parties to the JCPOA [Joint Comprehensive Plan of Action] to fully implement their obligations under the agreement. “We have repeatedly warned that President Trump’s beating of the war drum with Iran, even if confined to rhetoric, in addition to new Congressional sanctions and zero diplomatic outreach, could only produce negative consequences. Iran’s parliament has now voted to increase spending on its ballistic missile program and the IRGC [Islamic Revolutionary Guard Corps] in direct response to new sanctions on the country. “Unfortunately, elements in both the U.S. and Iran have pushed needlessly provocative steps designed to provoke a crisis and undermine the nuclear deal. In this instance, we have the President of the United States issuing counterfactual statements suggesting Iran is not complying with the nuclear accord and indicating the U.S. will blow up the deal. Meanwhile, JCPOA opponents in the U.S. rammed through new sanctions legislation despite warnings of how they would backfire. These sanctions have predictably empowered rather than marginalized the IRGC and hardliners in the country. “Rouhani’s statement and the Iranian parliament’s vote do not come as a surprise. Iranian moderates put their political lives on the line by negotiating the nuclear accord, and Iranian hardliners now have a partner in the White House who is helping them sabotage moderate proponents of engagement. We warned that new Congressional sanctions would lead to Iran doubling down on its missile program and the Revolutionary Guard, empowering hardline elements while destabilizing the JCPOA. That’s exactly what has happened.